The HCTV REMOTE White16GB disguises a high quality DVR in a simple univeral remote shell. 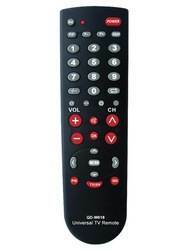 A common household tool, this "universal remote" is right at home in one of the most commonly used rooms in your house. Place it on top of an enterainment center and it blends right in with the 5 other remotes you surely have laying around but aren\'t quite sure what they do. High resolution color video. It is hard to imagine that camera fits in this every day black remote that takes 1280 x 960 resolution video at 30 frames per second. The HC TVRemote White has 16GB of internal storage Recording time. The TVRemote will record up to 3 Hours, with the battery lasting up to 2.5 hours before it needs recharging.